In this article, Custom Blinds & Designs – with two convenient locations in Lincoln and Omaha, Nebraska (NE) – is here to talk about Sonnette™ Cellular Roller Shades for homes in Lincoln, NE. We proudly carry the full line of Hunter Douglas window treatments, including their premium shades. 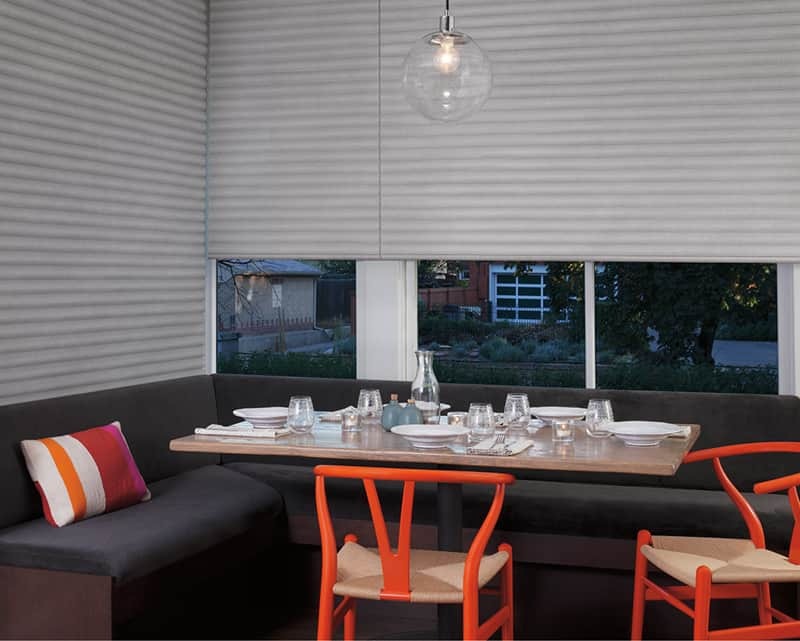 One of the newest and most innovative window treatments on the market, Sonnette™ Cellular Roller Shades are a unique combination of easy to use, light filtering roller shades, and the superior energy efficiency found only in honeycomb shades. Sonnette™ Roller Shades offer the best of both worlds in a variety of fabric and color options. Contact Custom Blinds & Designs today to learn more about Sonnette™ Cellular Roller Shades for homes in Lincoln, NE. In the same way, a cellular shade insulates your windows and helps to keep the inside temperate of your home at a constant comfortable temperature, Sonnette™ Cellular Roller Shades offer the same energy-efficient qualities. The unique curved design of Sonnette™’s vanes plays an important role in diffusing harsh sunlight into a comfortable ambiance, increasing the enjoyment of rooms that were once too hot or bright. Sonnette™ shades are available in both light filtering and room darkening fabrics to suit your specific design needs. Channeling the simple operating of a roller shade, Sonnette™ Cellular Roller Shades are available in several cordless, easy to use operating systems. When open, Sonnette™ rolls up completely into a discreet headrail so they don’t obstruct your view to the outside. Operating systems include the new and exciting PowerView® Motorization system. This new innovation allows you to operate your shades by simple program your desired settings ahead of time and ever giving your window treatments the second thought. Another option is adjusting your shades from the comfort of your couch using the Pebble® Remote Control or from anywhere you can use your smart device via the PowerView® App. Some other choices available are the LiteRise® system that allows you to raise or lower your shades by simply pulling them down or pushing them up. The SoftTouch™ system is another great choice. This is a battery-powered wand control system. Simply push up on the wand to raise the shades or pull down to lower them. Call Custom Blinds & Design today! Our team is friendly and knowledgeable and can help you find the perfect window treatments for your home. Stop by one of our beautiful showrooms located in Omaha and Lincoln, NE. At our showroom, you’ll be able to see, feel and operate all the latest in window coverings from Hunter Douglas. Proudly serving the grater Omaha metro area, call us or stop by today to get started!